These times are weird - in part because of our very weird and mentally ill President. What has struck me is how Trumps craziness seems to now have become normalized. People on TV, in conversations, ignore the obvious elephant in the room - namely that the President is fuc*ing nuts. Interesting and disturbing. What is even more disturbing is that about 1/4+ of the American population is right there with this nut. How on god's green earth did we end up like this? This is not normal, he is not normal! If he was just the crazy guy next door, that would be one thing. But having someone who is certifiably bat-shjit crazy as the President of the most powerful country on the planet is unbelievable. How can people who were fooled into voting for this madman even look at themselves in the mirror? Stunning. .
How on god's green earth did we end up like this? Well, let's start with the secondary culprit: conservative Christians in America, without whom the insane right would be simply a fringe. 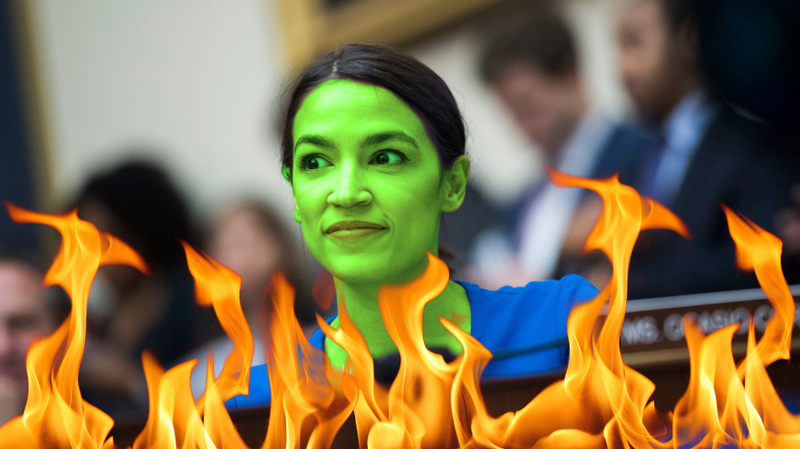 For evidence, I present to you the story of how Alexandria Ocasio Cortez is a Witch who has been driven by demons to cast spells on Trump. Seriously. Dave Kubal is a right-wing pastor who thinks that a literal witch coven, led by AOC, is casting "evil spells" on Trump 24/7. I don't think we have stopped considering them people. What I see over my lifetime is an advance in morality. An example is in my formative years the death penalty was still in force though little applied. The same was true in what became other EU countries. Now the death penalty is out in all EU countries, even in wartime, it's a condition of being in the EU. It's not that a progressive see the reactionary as not human but that they see them as relics of a more barbaric past and their older outlooks as immoral and absolutely requiring reform. Nobody sane today would tolerate the advocation of the reimposition of slavery, it would be regarded as being utterly beyond the pale. Ditto crucifixion or the maintenance of women as domestic chattels. As a child during the 50s-60s civil rights era, when Obama got elected I viewed it as a sign that the US was finally throwing off the relics of its slavery and racist past. Unfortunately that is not the case. Racist incidents and indeed killings are still common along with other right wing violence (which vastly outnumbers left wing violence). The morality of the bulk of the population advances slowly, sometimes in fits and starts (eg the MeToo movement), but advance it does. The consensus shifts and what was seen as just rude or crude before later becomes seen as utterly immoral, vile or barbaric. If a significant section of the population refuses to advance with the general moral sense then they will be seen as morally bereft. While there are many areas of morality and policy that I would regard as debatable (eg relative tax burden), there are some that are to me non negotiable, like voting rights and non-discrimination, just like previous generations would not negotiate with regard to murder, slavery, etc. As humans the dominant evolution is not biological but cultural (in the very broadest sense). What is acceptable becomes unacceptable then illegal and eventually unthinkably vile. I see the polarisation in the US as akin to the '50s and '60s, a period where the pressure of moral advancement has built up a lot of steam and society is advancing in a long delayed lurch, leaving the reactionaries ignored in their now immoral cesspit. In defence of the US, although they hardly need it from me, while there are still rascist attacks, they afre seen now for what they are, exposed for this and castigated. No longer is it "well, he should hav eknown not to be there" that sometimes was the case. We have our own version of this in sectarian attacks in Scotland. "He should have known not to wear a rangers top there" would no longer be uttered. Racist incidents and indeed killings are still common along with other right wing violence (which vastly outnumbers left wing violence). Ah yes, the number one culprit. In the 1960s the republican party sought to take the south by inviting disaffected democrats, the dixiecrats, into their GOP. And now it is their GOP. With regard to the US, I agree, the moral stance of the majority has shifted quite significantly, though there is a fair distance still to go. Other countries in the west still retain similar throwbacks, though overall not as numerous or virulent. The current upsurge in right wing extremism is partly due to them seeing that the majority opinion has distanced itself even further from them, they are getting frantic. A touch of "Last Stand" about them.